Ok, I admit it, I don’t drink enough water. That wonderful, life-giving, cleansing, necessity that does wonders for the body (clearer skin, brighter eyes, less fatigue - the benefits are endless), which we’re lucky enough in this country to be able to get for free, or thereabouts, from the tap. When I was offered a case of blk. water to review, I jumped at the chance. Offering serious hydration, and the chance it may aid a hangover (something this drinks writer knows plenty about), not to mention that is looks ridiculously cool, I was sold. Boasting a list of benefits which, I’ll be honest, I had to look into, it certainly sounded impressive: zero calories, you say? Great! Pure hydration? Check! Over 60 trace minerals? Bring it on! Alkaline ph? Sign me up! Essentially, it's a very pure mineral water, with added minerals and electrolytes. The fulvic trace minerals (derived from plant matter and fulvic acid, and apparently critical to the growth of plant and animal life) are what gives this stuff its colour. We lose electrolytes through exercise, sweating, and going on massive benders. Replacing these helps you feel like a normal human being the morning after 5 glasses of your favourite Cabernet Sauvignon. Well, water. It tastes exactly like mineral water. It's nicer than the stuff that comes out of my taps in East London, and totally different to the Yorkshire water from my childhood, but essentially, it's just water. I did a blind taste test with a friend who couldn't tell the difference. But that's not really the point of this stuff - it's meant to taste like water. The difference is in its appearance - it doesn't look like water, and that's what sets it apart. It oozes cool - just look at the bottle! That typeface, that branding! While I'm not convinced it helped my hangover much better than normal water does (and bacon, and coffee, and sleep), I did feel like a total badass drinking it, and surely presentation is half the fun when it comes to drinks? Look at the fuss we'd make if our martini wasn't in the correct glass, or if the lime peel used as a garnish was a bit brown round the edges. Looks matter, and this looks cool. 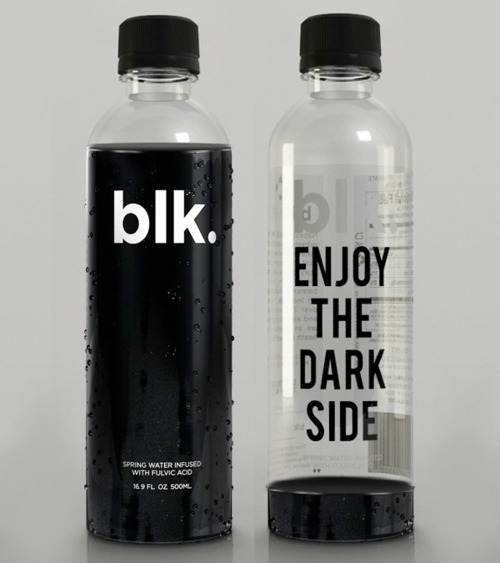 You can buy blk. water from Firebox for £14.99 per case of six bottles. As with all of our samples, we never exchange goods in return for a guaranteed good review, and this review contains nothing but my own true opinion. We only ever write about samples that we genuinely enjoyed and would buy - anything that we don't like either gets a critical review or no review at all.